Copies the properties and styles from one entity and then applies them to one or more other entities, with control over which properties are copied (short for "match properties"). Specifies the entity whose properties will be copied. Specifies the entities whose properties are to be changed. Specifies which properties are to be copied. The dialog box lists applicable properties, along with the current value of each one. Properties - changes properties assigned to entities. 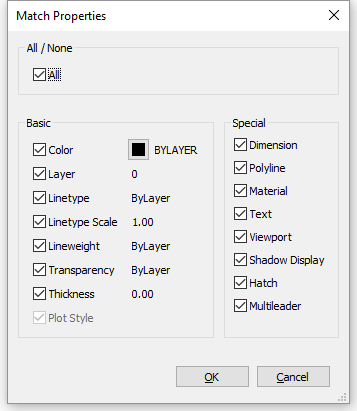 Layer - assigns properties to layers. Color - assigns the working color. Linetype - assigns the working linetype. LWeight - assigns the working lineweight.